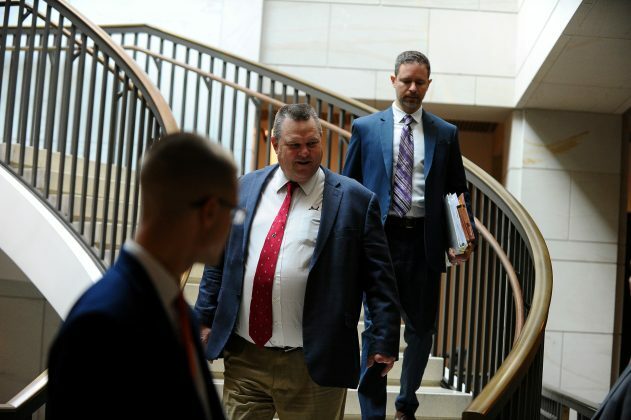 WASHINGTON (Reuters) – U.S. lawmakers negotiating a deal with President Donald Trump on border security funding on Thursday said progress was being made, with Democratic Senator Jon Tester raising the possibility of a successful conclusion to talks as soon as Friday. Senate Appropriations Committee Chairman Richard Shelby, who met earlier on Thursday at the White House with Trump, told reporters the 17 Senate and House of Representatives negotiators were on “a positive trajectory”. Shelby, a Republican, would not provide any details on a possible deal but said the situation had improved now that there was a better understanding of what Trump would support. The lawmakers are up against a Feb. 15 deadline for ending an impasse over Trump’s demand for $5.7 billion this year to help build a wall along the U.S.-Mexico border that he says is needed to deal with a crisis of illegal drugs and undocumented immigrants. Democrats have long said that a border wall would be ineffective and instead have fought for other means for improving security on the southern border. Funding for several federal agencies, including the Department of Homeland Security, will expire on Feb. 15. If no border security deal is reached by then, these agencies could go back into the partial shutdown mode that plagued them for 35 days beginning last Dec. 22. That episode ended when Trump and Congress agreed to temporary funding to give more time to talk about border security. Negotiators have discussed a mix of tools, such as more law enforcement agents, procuring more high-tech devices to repel illegal drugs and undocumented immigrants from entering the United States and additional physical barriers. But Trump has continued to insist on a wall, although it was unclear what his definition of that was. There already are more than 600 miles of vehicular and pedestrian barriers along the 2,000-mile (3,200 km) border. Meanwhile, some liberal House Democrats and immigration advocacy groups gathered outside the Capitol to demand funding cuts to U.S. Immigration and Customs Enforcement, which is in charge of enforcing immigration law in the interior of the country, including deporting undocumented immigrants. “An agency like ICE, which repeatedly and systematically violates human rights, does not deserve a dime,&rdquo; said Representative Alexandria Ocasio-Cortez. While immigrant groups and some Democrats have criticized ICE’s tactics as heavy-handed, Trump has praised the agency’s work in protecting the United States from what he calls dangerous criminals. This entry was tagged border security funding, border security negotiations, Government Shutdown, U.S. lawmakers, United States. Bookmark the permalink.